The importance of donations and gifts to nonprofit organizations cannot be undervalued or overlooked. The difficulty of nonprofit fundraising often lies in finding ways to attract and retain donors. One of the best ways to build strong connections with donors is to design a standout nonprofit website. The value of a website that is both informative, inspirational, and easy to navigate is critical to attracting donors. A quality website and social media presence is the best way to raise awareness of your organization, as seen in these case studies about the impact of media marketing. The logistics on how to create an effective website, however, may be a little fuzzy. You may feel overwhelmed at the prospect of creating your own website. You might wonder: how do I include all relevant material while also keeping visitors attentive and interested? So many internet users will judge an organization’s website immediately and click away from the page without another thought. However, there are steps your team can take to capture the attention of site visitors while inspiring them to become lifelong supporters of your cause. Make giving easy and accessible. Connect your website with other channels. An excellent website is the foundation from which you can launch an effective digital fundraising campaign and improve awareness of your organization. Is your team ready to jump-start your web presence? Let’s get started with these steps to creating a compelling (and effective) nonprofit website! 1. Make giving easy and accessible. Never force your donors to wrestle with your website just to find out what your organization does and how they can become involved. Donating to your organization should be seamless, effortless, and secure. Don’t forget, you are not the only nonprofit organization trying to figure out how to entice donors. Look at other websites and see what works and what does not to help guide your decision-making process as you create your site. Check out Morweb’s guide to the best nonprofit websites for more inspiration. Your visitors should not have to search for information on your site about your organization’s cause, its short-term and long-term goals, and ways for individuals to help your organization achieve these goals. Clearly labeling everything on your site will go a long way toward easing navigation. Placing the donation button on the running header and footer of your site will guarantee visitors will have an option to donate no matter what page they are on. Meanwhile, the donation button should still be front and center on the homepage to immediately offer an opportunity to give. To accept donations on your site, your nonprofit will need to invest in an online donation tool. If you are interested in learning more about online donation tools, click here. Another way to make giving easy and accessible on your site is to design a “Ways to Give” page. This page, like this example from the ASPCA, will summarize all of the different ways an individual can give back to your cause. Recurring donations (i.e. monthly, quarterly, yearly). Matching gifts are a unique way to double the impact of your supporters’ contributions by accessing untapped revenue from corporate philanthropy programs. Unsure whether your supporters work for companies that offer matching gift programs? Link to a matching gift database on your Ways to Give page, like this matching gift search tool from Double the Donation. Simply creating these pages for your site visitors is not enough. You should also make sure that everything on your website is mobile-friendly so that people may donate easily from any device. This includes any forms your organization may require donors to fill out upon donation. As a nonprofit, your organization is dedicated to increasing social good and your website is one of the most easily accessible ways for individuals to get a sense of what it is you do. With such an important role in your organization’s success, your website should look professional and be consistent in its design. This will encourage your visitors to trust your website and by extension, your organization. This step may seem intuitive to some or perhaps even arbitrary to others, but it cannot be forgotten. It is all too easy for a potential donor to become discouraged from donating to your cause. With one little click of a mouse or swipe of a finger, they can to leave your website and never return. If you want to monitor your site’s traffic and understand the analytics behind your website’s success, there are plenty of programs that can provide this information as well. A clear and consistent color scheme that complements your logo is an essential way to produce a stylish, unique-looking website. People should be able to identify your logo and immediately make a connection to what you do. Your logo should be displayed prominently throughout the website in order to forge this connection. To see a great example of dominant logo placement, check out the ASPCA website. You can see their logo displayed largely in both the header and footer of every single page, constantly reminding the viewer of the organization behind the website. The custom donation pages should be created with the style of the website in mind. This reassures the donor that their donation information is protected. Include your branded color scheme, your logo, and other imagery that associates these pages with your cause. On your website, you should leverage many opportunities to shine some light on people who volunteer for your organization. This is your chance to demonstrate the kind of work your organization does while also humanizing your cause and playing on your viewers’ empathy. By keeping your constituents in focus, you are constantly reminding your viewer what your nonprofit stands for. An impact page on your website is where the viewer will go when they want to find out what exactly your organization is doing for its cause. It should clearly answer the question: What are the core actions this nonprofit takes to further its mission? Make sure your responses to this question are clear and concise. It may help to include images to demonstrate the actions alongside your descriptions to build a sense of authenticity. In addition to photos, videos from constituents will increase the impact of your message. Volunteers or existing donors can share what they find inspiring or amazing about your organization’s work and convey why the work you do is vital to the social good with which your organization is concerned. The number one rule of asking for donations is simple: always demonstrate transparent gratitude. Say “thank you” often and publicly. This may take the form of a regular donor spotlight where you highlight a specific donor’s contributions and provide specific information about the potential impact donors and volunteers can have. This is the age of social media: take advantage of it. With countless social media platforms, there is a wide range of ways to connect with potential donors. Social media allows for new and creative ways to market your nonprofit that you might not be able to accomplish on your standalone website. Put links to your social media accounts in the footer of your website to allow for easy access. The goal is for an individual to visit and follow one of these accounts. Then, they will still receive reminders of the work you do and how they can help long after they leave your website. Your website should also have an easy way for people to sign up for mailing lists. This can include the option to either join an email newsletter or receive direct mail. The mailing lists will once again provide opportunities to encourage donations and volunteering opportunities later on down the line. Social media allows you yet another outlet on which to promote events supported by your organization. You can include information about upcoming fundraising events such as a walk-a-thon, charity auctions, networking dinners, etc. The goal is to provide people with easy ways to get involved while learning more about your organization. Don’t get overwhelmed by the seemingly endless social media potential. Use it wisely. You don’t want your community to become annoyed by your persistent posts or feel as though they are constantly being pestered for money on their personal feeds. If you are new to social media or you do not know which social media platforms will be good for your organization to join, don’t worry! There are pros and cons to each media platform and you should not feel like you have to have an account on every single one. Try reading about the different platforms before creating your accounts. By introducing visitors to other engagement channels while they’re visiting your nonprofit’s website, you make the most of this platform by encouraging opportunities for engagement even after they leave your site. 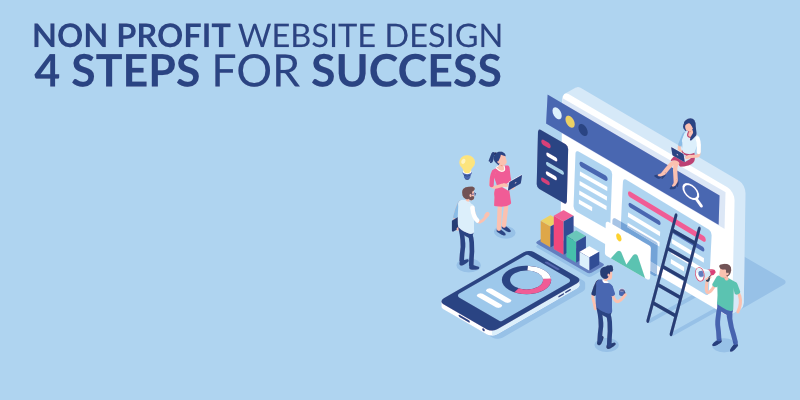 If you keep these four simple steps in mind when creating your organization’s website, your efforts will result in a creative and effective site. Now that you have explored our tips and tricks, it may also be helpful to view some of the top ranked nonprofit websites to see these steps in action. Good luck and happy web creating! Author Bio: Adam Weinger is the President of Double the Donation, the leading provider of tools to nonprofits to help them raise more money from corporate matching gift and volunteer grant programs. Connect with Adam via email or on LinkedIn.